While plugged in the charger has a bit low maximum current it can deliver. As visible in the video I was able to pull a maximum of about 2.3A from the USB ports (any combination) before the charger would shutdown. Although this functions ok, I like a hiccup function more, still it works well and if you overdraw it, it just shuts down which is safe. My EBD-USB tester confirms what we saw in the video, around 2.3A is the max you can draw from the charger (any combination of ports) before it shuts down. This is fine for one device, charging 2 will probably also still work but more then that isn’t suited for this charger. The charger having 3 ports with this amount of output Amperage is a bit much, one or maybe two ports would have been better. I guess I can understand having a dedicated USB-C port looks nice, but still, you can’t really use the 3 ports the device has. This charger displays the same efficiency as we’ve seen from most chargers of the last few years. Depending on load if varies between 80% to 85% efficient which is average/good. While charging the power bank at the same time as trying to charge your phone the internals of the charger auto regulate and prioritize charging your phone. Once the phone becomes full it will automatically divert power to the power bank part and charge that. This behavior is fine. I had the hope charging the power bank would be separate from charging the device but they share the same power supply. Still, in most situations this is fine. Pulling the 2-in-1 from it’s socket automatically enables the power bank function. It does not do this continuously so there is a little hiccup of a few seconds. Comparing this graph with the one above you can see the power bank portion of this 2-in-1 can actually deliver more power to a connected device then while being plugged in. We see a total power delivery of around 3A (again, the same for one port or multiple ports). Interesting that the internal battery can actually deliver more then the internal charger. Still, that means you can (in most cases) comfortably charge 2 devices at the same time. Since this is also a power bank, we need to measure the amount of power we can draw out of it. Using my tester set to a continuous load of 1A I reached a maximum of 3269 mAh drawn from the battery. Voltage was kept nicely in control until the power bank was empty. Since this is done using 5v and the rated capacity (5000mAh) is given in the battery voltage (3.6v in this case) the result achieved is good. 3269@5v converts to 4953mAh@3.6v which is almost exactly the stated 5000mAh. Recharging the powerbank we see a total power draw of 0,02597kWh. Translating this to mAh this comes down to just around 5.6456mAh @5v. Meaning about 12% was lost during conversion from AC to DC to go into the battery, that is pretty much average/good, the same as most other chargers do. All in all, this is a very decent 2-in-1. It isn’t the summum of technical prowess but it does use good components and works well for it’s purpose. I really like the design and out shell, it isn’t that much larger then some other chargers and while it won’t provide more then enough power to use all ports at the same time, as a normal charger and a power bank which is automatically available when the power is out, it’s a very nice product! I like Rock stuff as quality Chinese stuff. I was looking for this kind of charger because anker won’t make EU plug 2 in 1 charger/bank, Great review, good job! 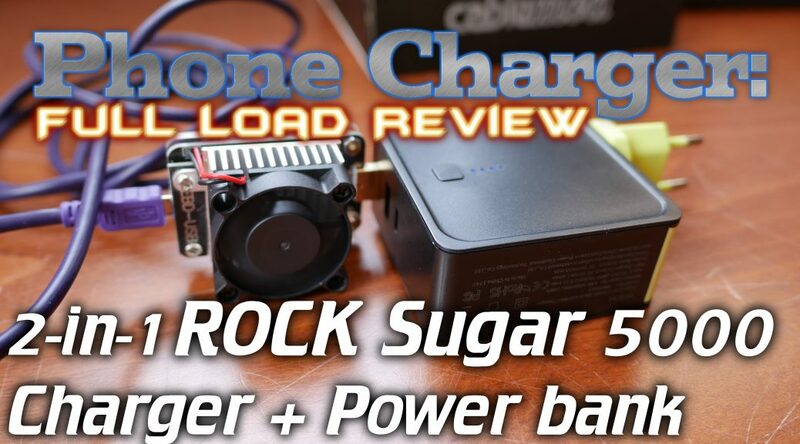 The given information about rock 2 in 1 5000mah power bank is properly explained in this article but I have a question that is this power bank is good for Apple products?